Ballenridge is conveniently located in the middle of town, right behind the library/cultural center. The subdivision also has additional access right off 55. For being an affordable subdivision most of the home feature large treed lots. Homes range from 1,300-2,300 sf. including ranch style and 2-story homes. 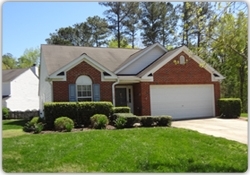 The subdivision has an HOA managed by CAS Inc and currently is $250 annually for maintenance of common areas. Ballenridge has there own facebook group that is a closed group. If interested in more information you will have to send a request. If you have children and schools are important to you, make sure you check out our Holly Springs School page. If you know the property that you're interested in buying, you can check on the base school assignment to see what schools have been assigned to the address.